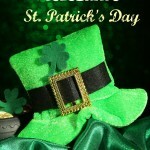 Happy St. Patricks Day! I hope you and your family had a great time celebrating St. Patrick’s day. I know we did at our house. 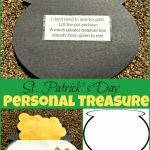 We tried out most of the ideas I mentioned in my ways to celebrate St. Patrick’s day post and had a blast doing it. 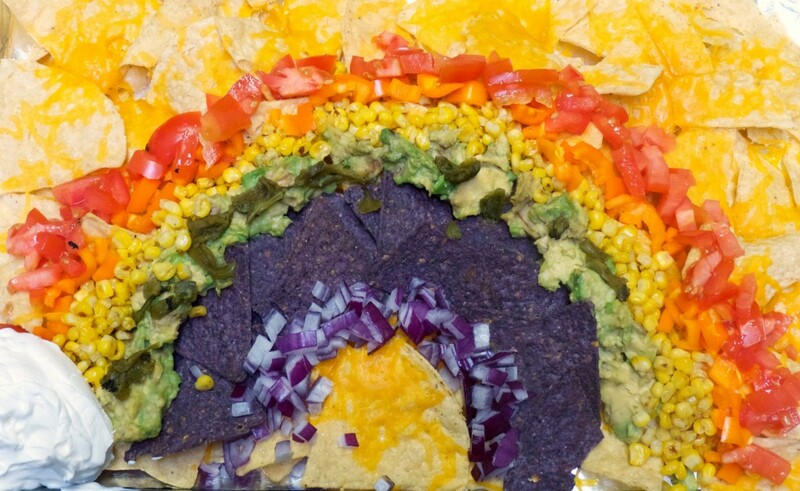 For dinner, I decided to make a rainbow nachos to go with our rainbow themed dinner. We also had a rainbow fruit salad and Sprite with rainbow sherbet. 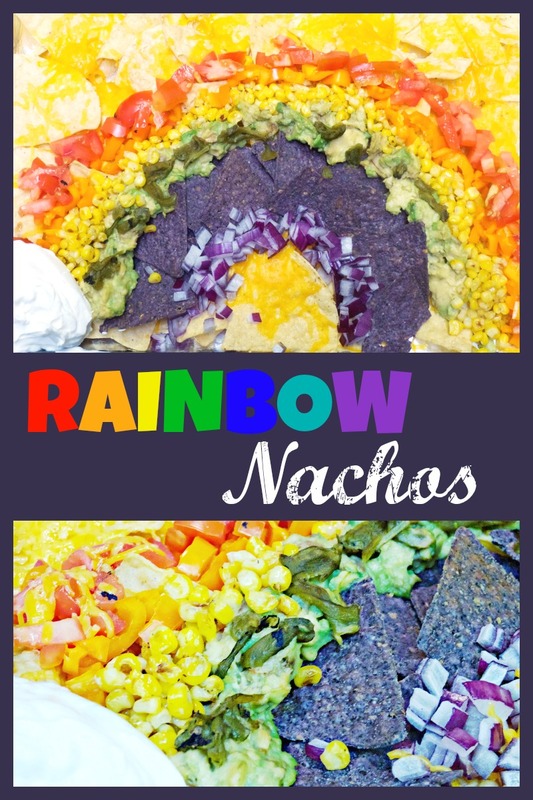 The kids were so excited about having rainbow nachos for dinner and watched eagerly as I added each color topping to the dish. Even though my kids usually won’t touch tomatoes or onions they gobbled down this meal with no complaints. 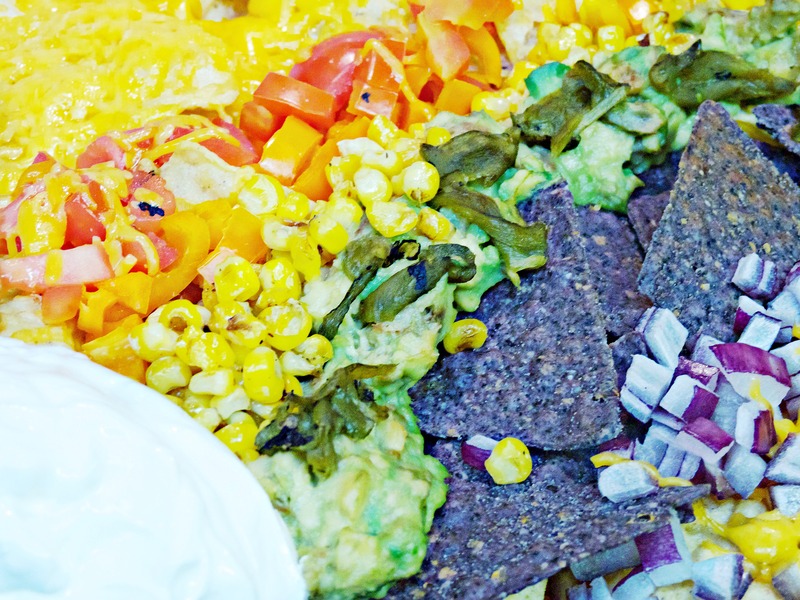 If you’re looking for a fun rainbow dish to share with your family this St Patricks Day these easy and delicious rainbow nachos might be just the things! First, put a layer of tortilla chips on a foil lined baking sheet. Make sure they are well spread out so each chip will have toppings on it. 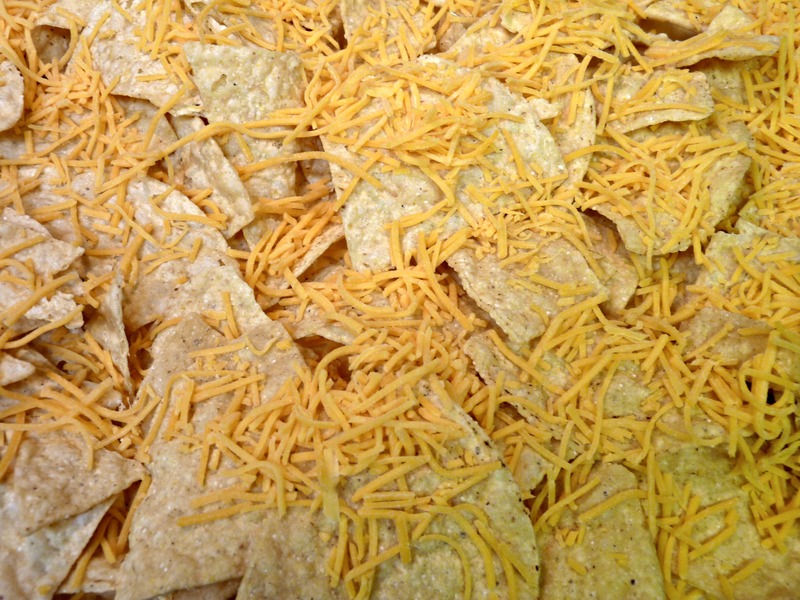 Next, generously cover the chips with shredded cheese. I used cheddar because that’s what we had on hand but you could use whatever type you want as long as it melts well. I put the rainbow together from the bottom to the top so I wouldn’t have to worry about running out of space. 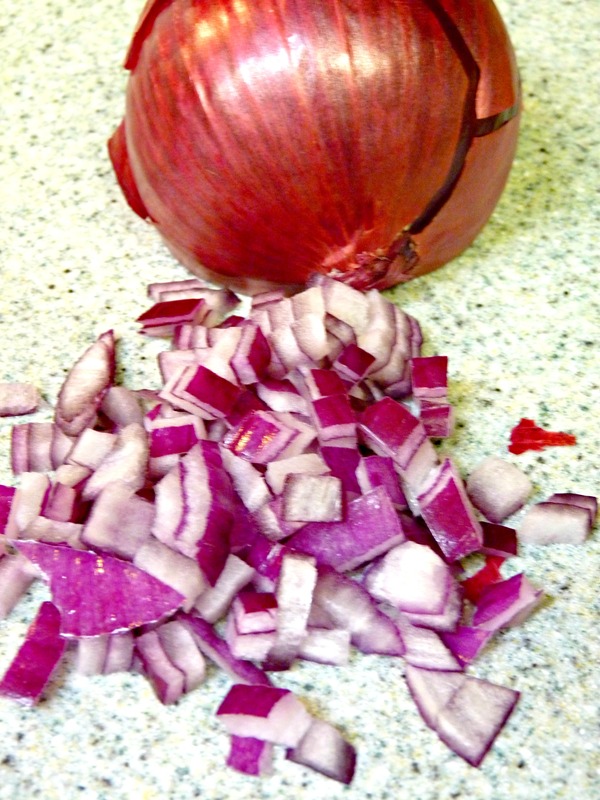 So to start I added a half circle of red onions. 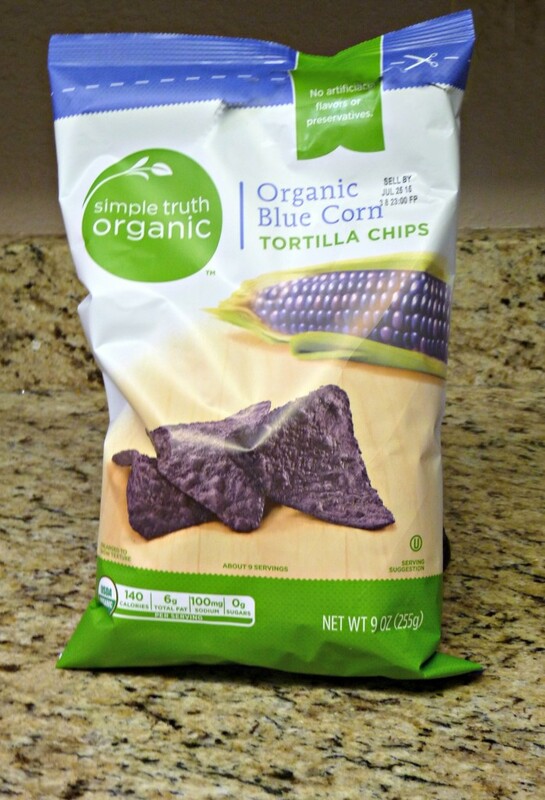 For the blue layer, I used blue corn tortilla chips. I found these in the organic aisle at our local grocery store. I layered the chips above the onion layer. Then, I put the tray in the oven and broiled it on high for a few minutes. I did this because I wanted the cheese to be well melted but didn’t want some of the other ingredients to be under the heat for quite as long. 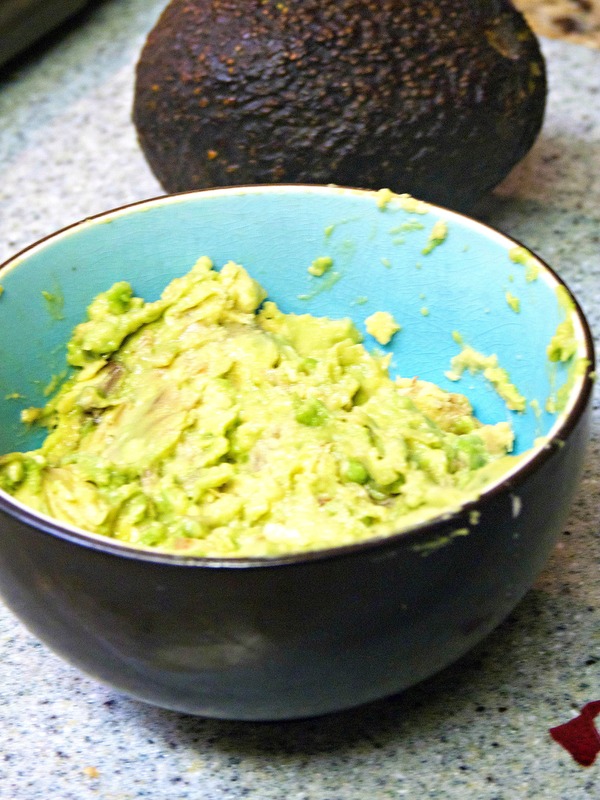 Then I added a layer of avocado. I smashed it up before adding it so that it would spread on easily. I also added green chills to ours because we live in New Mexico. This means we pretty much add green chili to everything. 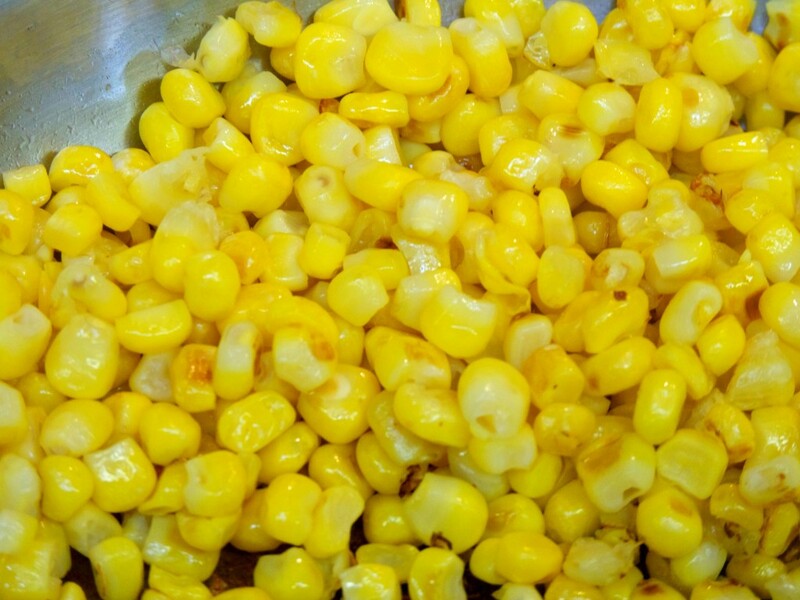 Next came the layer of corn. I used frozen sweet corn and cooked it in a frying pan before adding it to the top of the tortilla chips. 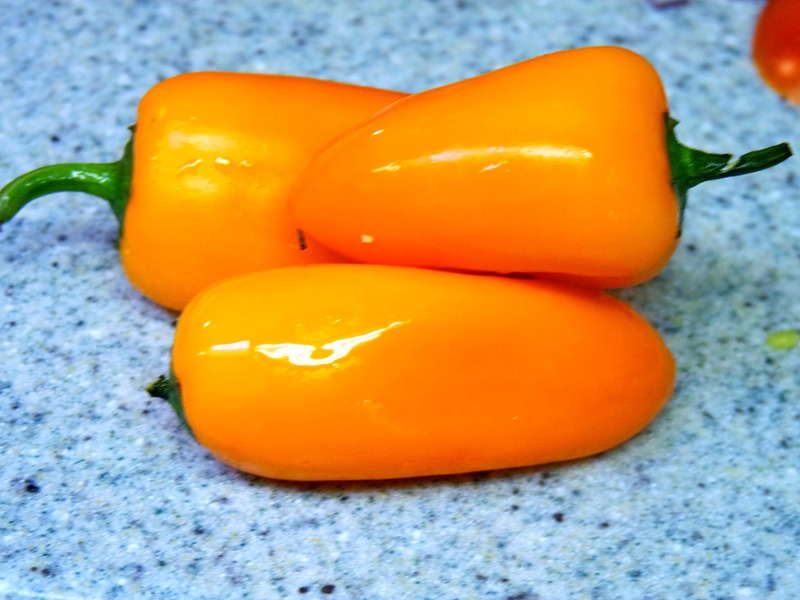 I chopped up a few orange sweet peppers and added them in for the orange layer. I added chopped tomatoes to complete the rainbow. Then I added some more cheese because you can never have enough cheese on nachos. I put them back under the broiler on high until the cheese started to bubble. After removing them I finished them off by adding a sour cream cloud to the corner. I also cooked up a pan of ground beef and black beans with taco seasoning that we topped our rainbow nachos with. These tasted delicious, looked great and were super easy to make. I hope your family will enjoy them as much as mine did. 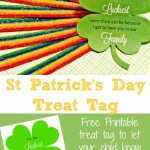 Do you have a fun St. Patricks day recipe you like to make with your family? I would love to hear! Please comment and share.